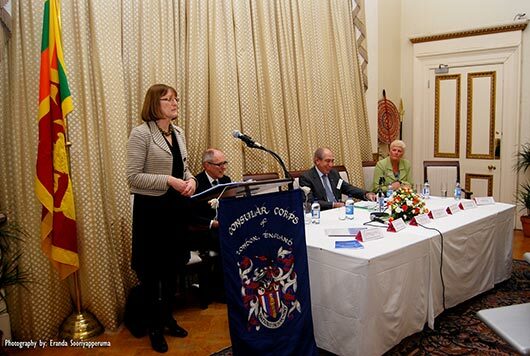 Executive Committee member of the Consular Corps of London, Chaminda Kularatne organised the 999 Seminar of their Consular gathering at the Sri Lanka High Commission in Hyde Park Gardens, London recently. 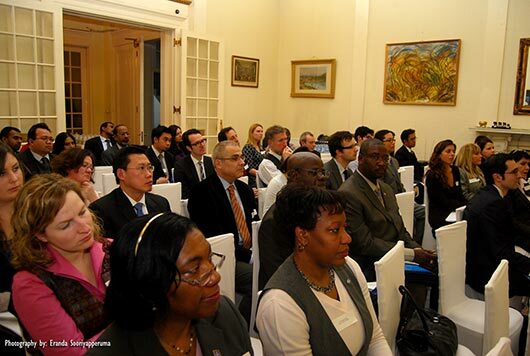 A large number of diplomatic officers turned up at the Chancery of the Sri Lanka High Commission to attend the 999 Seminar conducted by the Consular Corps of London. 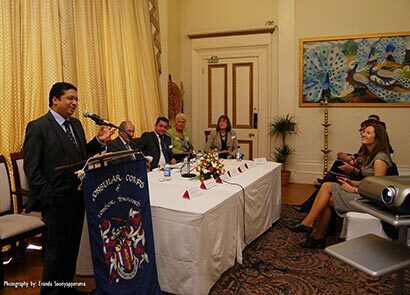 There were 65 participants representing more than 55 diplomatic missions and consular offices based in London and Dr Chris Nonis, High Commissioner for Sri Lanka warmly welcomed the diplomats. 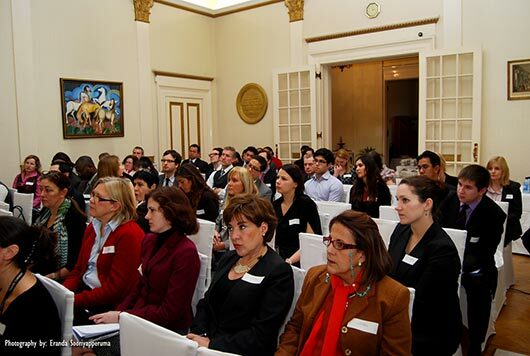 The objective of the seminar was to educate diplomats regarding the action which they should take when handling a death of a foreign national whilst in the United Kingdom. Addressing the gathering, the High Commissioner briefed them about post conflict development and reconciliation process taking place in Sri Lanka. He requested the diplomats not to listen to the malicious campaigns carried out by certain elements of international media and NGOs with hidden agendas and invited them to visit the country personally to witness the true peaceful situation and the massive development and reconciliation process with their own eyes. Prof Paul Matthews, HM Coroner for the City of London, Ms Heather Scott and Ms Gill Piloni of New Scotland Yard and Ms Sue Anderson of Rowland Brothers also addressed the seminar. The participants were treated to Sri Lankan snacks and tea. This event can be noted as a rare occasion where such a large number of diplomats attended the Sri Lankan Mission at one time after many years. 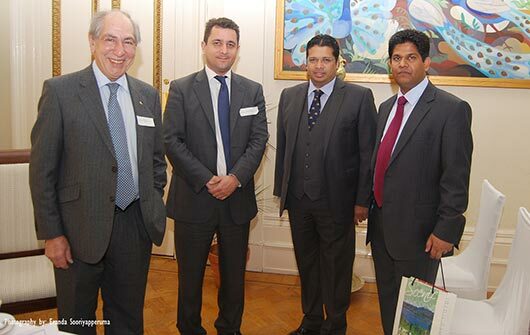 Diplomat Chaminda Kularatne (Attorney at Law), Minister Counsellor handling consular affairs and immigration at Sri Lanka High Commission in London was instrumental in making arrangements for the successful conduct of this seminar at the High Commission premises. Mr Kularatne was elected to the executive committee of the Corps in November 2011. His appointment is for three years and first Asian diplomat to hold this position after five years. It is the first time that a Sri Lankan diplomat has been appointed to this committee. The Consular Corps of London, established in 1902, is a prestigious association of diplomatic officers handling consular affairs at the diplomatic missions and honorary consulates based in London. Podi Kolla Nonis is earning his living the hard way while Dayan J is enjoying himself in Paris scoring own goals by letting the LTTE stamp fiasco escape through. I undestand from reliable sources that DJ got a mouthful from MR for not keeping the goals properly and was threatened with a one way ticket back to Colombo if he is not more vigilent. While the HRC enquiry on ethnic clensing at the end of the war in 2009 being around the corner all frontline attack dogs of MR have now started barking. In the process Nonis is spoiling his name and could serve the humanity better as a medical doctor. This fellow ‘Udurawana’ is undoubtedly a diaspora Tamil hiding under a Sinhalised pseudonym. Every now and then he vomits his bilge in this website. The fool deludes himself into thinking he is very clever! I am very proud of our HC in UK, Dr Nonis, and Chaminda Kularatne, who has been appointed Executive Committee Member of the Consular Corps of London. They are high calibre sons of Motherlanka and true patriots who serve well SL interests, in apprising Reps of 55 Diplomatic Missions in UK of the true developments taking place in SL on fast track and genuine efforts of Hon President to make SL a ‘ONE NATION ONE COUNTRY’ irrespective of his detractors and enemies who try to prevent such development and sow dischord. When diplomats attempt on doing their task right, ie. to educate forign diplomats and other forign officials educated of the truth about Sri lanka, some people start barking like stary dogs. This is well expected and also helpful in identifying who is what. By the way, great job well done Mr. Nonis. While no one is perfect (including those stray dogs roaming without a country) you are trying your best without fear.